Now showing in a Hertfordshire garden. Not a crime shed. Maybe he’d just found his dog, always worth celebrating. I never did Greek, but interesting that the word is quite recognisable even to me. I must admit I thought it very strange that the guy who has inherited the statue should put it close to the road rather than in his back yard where he could see it. My assumption was that he didn’t like it, wanted it out of sight of the house and was making it easy for thieves to steal it. Probably wants the insurance instead! Tell me about the dog please. CO, can’t help much, sorry, except that Xenophanes said Pythagoras believed in the transmigration of souls, and that Pythagoras once stopped a man from beating a dog, saying he heard the voice of his dead friend in the dog’s cries. … I may be exceedingly dim and only a poor medieval historian…. … but what has Pythagoras got to do with ‘εὕρηκα’? … was it not Archimedes, in the tub for his weekly wash, who worked out that the volume of water displaced equalled the volume of his body and then ran through the streets, naked, screaming “εὕρηκα, εὕρηκα”? So, Janus, who is this statue supposed to represent? I was being polite! and not pointing it out. What do you expect from a bunch of old farts? Janus – the picture that you posted is actually a statue of Diogenes, not Archimedes. A bit of an Archimedean screw-up all round then? Nice doggie. Of course it’s a nice doggie! 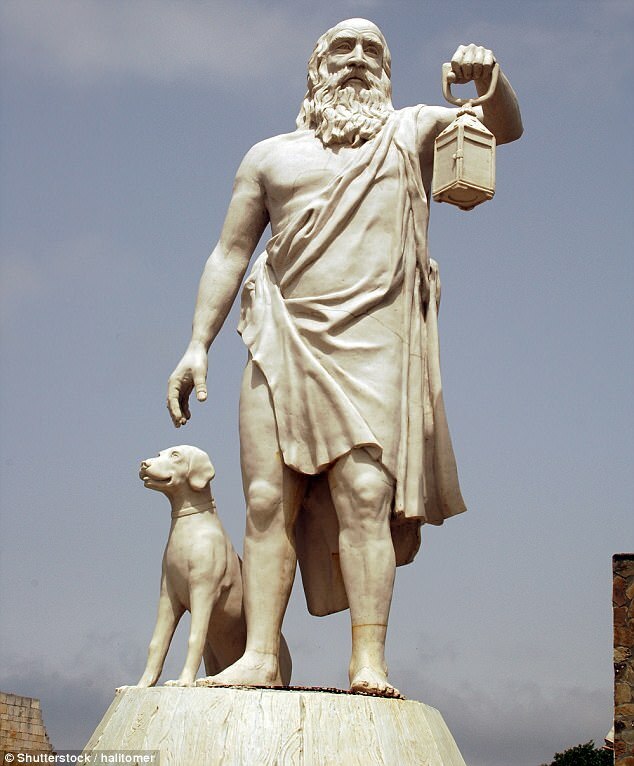 Diogenes founded the Cynics (who later became the Stoics), and as you know from your Greek, ‘cynic’ means ‘dog-like’. “Dodgy-knees” (as we knew him in the Upper Science Sixth) was a great believer in the dog’s view of the world. It’s all Greek to me I’m afraid. I do seem to remember a story about a guy who had a triangular bath and as he was about to get in, an apple fell on his head, causing him to tumble into the bath headfirst, displacing far more water than his body volume. The gravity of his confusion and gross lack of understanding of thermodynamic principles, together with the rapid heat exchange between the scalding bath water and his pale white body caused this, now red hot person, to go blistering down the road naked, shouting obsceneties of some sort. But I do get so muddled up these days. Gaz, I know what you mean. My father must be turning in his grave – he was Art Editor for the Daily Mail many years ago – I don’t think there were too many ‘mistakes’ in his time! On The Chariot Bearsy misses very few, if any clangers as far as I know – and I should know. Sob! As regards the current DM, he is overloaded. It’s like shooting fish in a barrel. For example, nobody has ever ‘ejected’ from a P-51 Mustang, a WWII fighter of similar vintage to our Hurricanes and Spitfires. The DM’s pimply media graduates apparently know differently having watched the beach volleyball and shower scenes from Top Gun. On a serious point, it is the lack of general education that is letting ignorance past the sub-editors There is a general knowledge that you and I of a certain generation would take for granted and need to know, but in a social situation these days Google is not necessarily your friend. At school, copies of the Times, the DT and the Grauniad were provided on a stand-up rack outside the library every day and everybody was encouraged to read then, not for the political content per-se but to see how English ought to be written and read. OZ, similarly we were encouraged to read the Observer, without political implications, I’m sure. The other symptom of the modern sub-editor is reliance on the spell-checker device, which leads them into ridiculous non-sequiturs. Previous Previous post: Mildly amusing… For some.